PRISTINA, Kosovo (Feb. 17) - Kosovo's parliament declared the disputed territory a nation on Sunday, mounting a historic bid to become an "independent and democratic state" backed by the U.S. and European allies but bitterly contested by Serbia and Russia. "Kosovo is a republic - an independent, democratic and sovereign state," Kosovo's parliament speaker Jakup Krasniqi said as the chamber burst into applause. 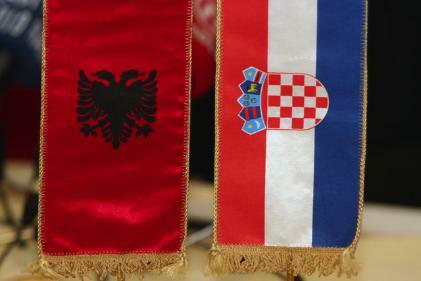 The ethnic Albanians who make up the majority of Kosovo's population declared independence from Serbia on Sunday. It's only one of several statehood movements around the world. Here, Kosovars carry an Albanian flag Friday as they anticipate the creation of a new nation. Hours after the declaration, an explosion apparently caused by a hand-grenade rocked a U.N. courthouse in the Serb-controlled north of Kosovo, but no one was injured. In Pristina, however, the mood was jubilant. Revelers danced in the streets, fired guns in the air, and waved red and black Albanian flags and American flags. Many dressed in traditional costumes and played trumpets and drums. Thousands of ethnic Albanians streamed into the city from neighboring Macedonia. "This is the happiest day in my life," said 68-year-old Mehi Shehu. "Now we're free and we can celebrate without fear." The new nation's leaders signed their names on a giant iron sculpture spelling out "NEWBORN" before heading to a performance of Beethoven's "Ode to Joy" by the Kosovo Philharmonic Orchestra. "I feel stronger," said Ymer Govori, 36, carrying his daughter on his shoulders. "I have my own state and my own post code, and it won't say Serbia any longer." The declaration was carefully orchestrated with the U.S. and key European powers, and Kosovo was counting on swift international recognition that could come as early as Monday, when EU foreign ministers meet in Brussels, Belgium. But by sidestepping the U.N. and appealing directly to the U.S. and other nations for recognition, Kosovo set up a showdown with Serbia - outraged at the imminent loss of its territory - and Russia, which warned that it would set a dangerous precedent for separatist groups worldwide. Ninety percent of Kosovo's 2 million people are ethnic Albanian - most of them secular Muslims - and they see no reason to stay joined to the rest of Christian Orthodox Serbia. Krasniqi, Prime Minister Hashim Thaci and President Fatmir Sejdiu signed the declaration, which was scripted on parchment, before the unveiling of a new national crest and a flag: a bright blue banner featuring a golden map of Kosovo and six stars, one for each of its main ethnic groups. "From today onwards, Kosovo is proud, independent and free," said Thaci, a former leader of the guerrilla Kosovo Liberation Army, which battled Serbian troops in a 1998-99 separatist war that claimed 10,000 lives. "We never lost faith in the dream that one day we would stand among the free nations of the world, and today we do." Thaci pledged the new nation would be "a democratic, multiethnic state" - an attempt to reach out to Serbs who consider Kosovo the cradle of their medieval culture and religion. But he also had stern words for the Serbian government, saying in the Serbian language: "Kosovo will never be ruled by Belgrade again." Thaci on Sunday signed 192 separate letters to nations around the world - including Serbia - asking them to recognize Kosovo as a state. Serbian President Boris Tadic rejected the independence bid immediately, declaring Sunday's proclamation "unilateral and illegal." Kosovo's 10 minority Serb lawmakers boycotted the parliamentary session in protest. And Serbia's government minister for Kosovo, Slobodan Samardzic, said Sunday that Serbia would increase its presence in the roughly 15 percent of Kosovo that is Serb-controlled - an apparent attempt to divide the province. Serbia's government ruled out any military response as part of its secret "action plan" drafted earlier this week as a response, but warned that it would downgrade relations with any foreign government that recognizes Kosovo's independence. Russia's Foreign Ministry said Moscow supports Serbia's "just demands to restore the country's territorial integrity." Russian President Vladimir Putin has argued that independence without U.N. approval would set a dangerous precedent for "frozen conflicts" across the former Soviet Union and around the world. He is pressuring the U.N. Security Council to intervene, and the council planned to meet in an emergency session Sunday afternoon at Russia's request. Before Kosovo's parliament voted, President Bush said the U.S. will work to prevent violent clashes after the independence declaration. The State Department was reviewing the development with European allies as the province sought swift recognition from the West. "The United States will continue to work with our allies to do the very best we can to make sure there's no violence," Bush said several hours before Kosovo's parliament approved the declaration. "We are heartened by the fact that the Kosovo government has clearly proclaimed its willingness and its desire to support Serbian rights in Kosovo," Bush said. "We also believe it's in Serbia's interest to be aligned with Europe and the Serbian people can know that they have a friend in America." The EU's foreign ministers plan to meet Monday. While all 27 EU nations endorse an aid plan for Kosovo, several - Greece, Romania, Spain, Cyprus and Slovakia among them - say they will not recognize the territory's independence. "We appeal to all parties in Kosovo and in the wider region to remain calm and not to respond to any provocation," EU spokesman Jens Mester said. "The international community will not tolerate violent action in Kosovo." Kosovo had formally remained a part of Serbia even though it has been administered by the U.N. and NATO since 1999, when NATO airstrikes ended former Yugoslav leader Slobodan Milosevic's crackdown on ethnic Albanian separatists. Kosovo is still protected by 16,000 NATO-led peacekeepers, and the alliance boosted its patrols over the weekend in hopes of discouraging violence. International police, meanwhile, deployed to back up local forces in the tense north. The ambassadors of the 26 NATO nations will meet in special session Monday at the alliance headquarters. NATO said Sunday in a statement that it has no immediate plans to increase its peacekeeping force, and that it "will continue to provide security for all citizens of Kosovo, majority and minority alike." this article is inspiring. it brought me to tears when i read it. whoever wrote this, is very poetic. bravooo! !